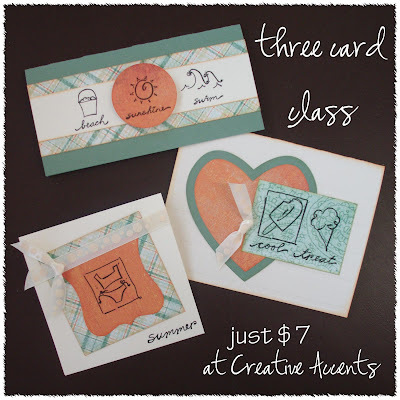 Well now, enough of that "Christmas Card" nonsense... this week's three card class will get us back to cards celebrating SUMMER! These three cards feature something many people have trouble with or questions about: Rub Ons! All the images & words are included on a sheet of rub ons, which will give each class participant some extras to take home, too! The fresh & cheery papers are a combo of a fun plaid by My Mind's Eye and some 'solids' by Basic Grey. I hope you like the cards and will join us to create them on Thursday! Because we're using rub ons, space is limited, so please reserve your spot today!